One of the best things I've learned about fly fishing over these past few years is that it is a hobby that can be tailored specifically to you, and there is a world of information out there no matter which direction the fly takes you. Whether you’re into freshwater or saltwater, classic bamboo rods or ultra-modern carbon fiber, fishing from the bank of a small pond or from the bow of a flats boat on a rushing river, there is something in fly fishing for everyone. For me, the big draw to fly fishing was being able to combine my love of fishing with my love of hiking. I spent a lot of time thinking about being able to hike through the woods for a few hours to find a small stream full of native trout that aren't so heavily pressured that everything has to be perfect to hook them. I've decided that 2015 is going to be my “Year of the Bluelines”. This is the year that I wear out a new pair of hiking boots trekking through the national forest in search of the streams that only show up on a topo map as a blue line. a good pipe and a good book. Now, I've always been the type of guy that has to exhaustively research an endeavor before I let myself embark on it. Lucky for me, I've befriended the guy who wrote the book on bluelining in North Georgia, literally!!! At first glance this looks more like a pamphlet than a book, but prolific outdoor writer Steve Hudson has managed to cram an extensive amount of information from his more than 40 years of experience into these 76 pages. 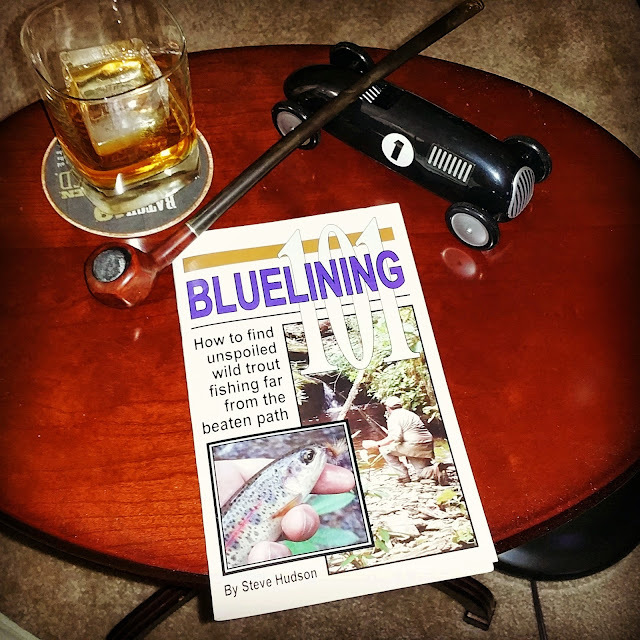 “Bluelining 101: How to find unspoiled wild trout fishing far from the beaten path” covers every aspect of bluelining from the definition of a blueline to reading topo maps, to what gear to take and what flies to pack. There are even sections in the book on approaching the stream, casting in cover and reading the water. After reading Steve’s book, I really feel much more prepared to tackle some blueline streams this year. His enthusiasm for the hobby really shines in all of his writing and when you finish reading this book you’ll be ready to lace up your hiking boots, grab your ultralight fly rod and hit the woods with a topo map in hand. You can find Bluelining 101 at most local fly shops in North Georgia, a selection of them are now listed on Amazon or you can order directly from the publisher, Chattahoochee Media Group.